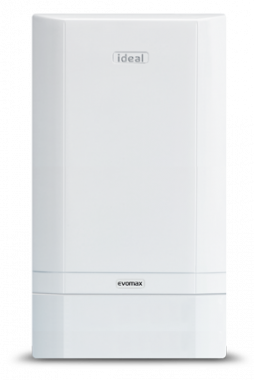 DISCONTINUED.The EvoMax 30 is a regular gas boiler and needs to be installed as part of a heating system alongside a hot water storage cylinder, cold water storage tank and a feed and expansion tank. This means it is not really suitable for smaller homes where space may be limited. This condensing boiler has been designed and manufactured by Ideal and includes a variety of feature and benefits. It has an efficiency rating of 96.7% making it an A rated boiler. This particular unit has an output of 30kW making it perfectly suited for medium sized homes without an an excessive need for hot water. This boiler is also available in outputs of 40kW, 60kW, 80kW, 100kW, 120kW and 150kW. It is a compact boiler that is able to be a wall mounted or a floor standing boiler with the optional frame and header kits offering in-line and back to back cascade. This means it’s able to be placed just about anywhere helping those homes where space may be limited. This boiler is available as natural gas or LPG. Key features include a robust cast aluminium silicon alloy heat exchanger, high 5:1 turndown, up to 110% part load efficiency and NOx <40mg/kWh (class 5) for all natural gas models. It features a simple control interface that features a large backlit display helping to give you maximum control over the boiler. This unit also includes a 5 year warranty on parts and labour helping to give you that added security.